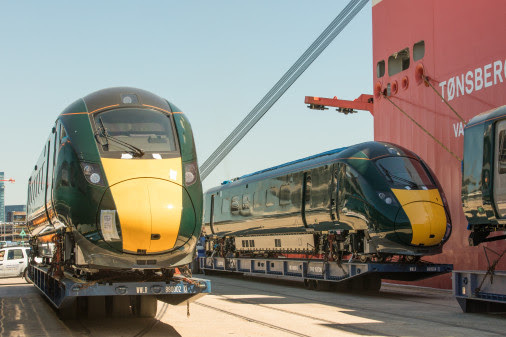 The first Intercity Express Train bound for GWR’s Devon and Cornwall route has now arrived in the UK. From 2018 a new fleet of Class 802 Intercity Express Trains will connect London Paddington to Exeter, Plymouth, Penzance and many more communities. 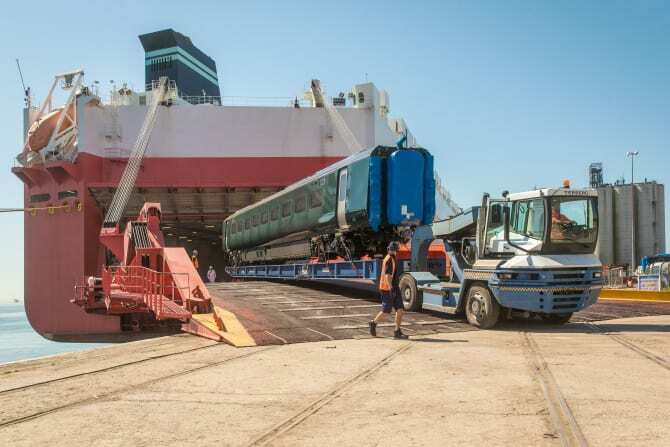 A five car test train (802 001) built at Hitachi’s factory in Japan arrived in Southampton port this morning, Saturday 17 June. The train was welcomed onto UK soil by GWR (train operator), Hitachi (train manufacturer) and Eversholt Rail (financiers of the Class 802 fleet). The train will now be made ready to begin testing in the coming weeks prior to entering passenger service from summer next year. Two further test trains are due to arrive in the UK shortly. 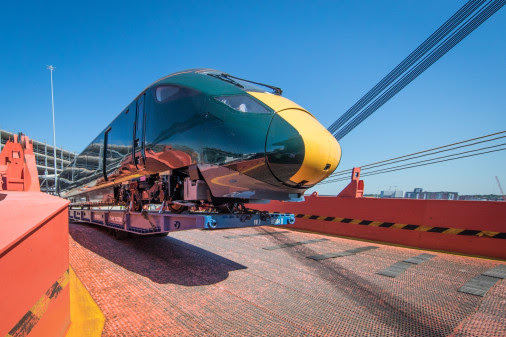 The 36 train fleet is fitted with bi-mode technology, allowing trains to use both diesel and electric power, and passengers to enjoy the benefits of new trains as soon as possible. From this autumn, the first wave of InterCity Express Trains will run on the historic Great Western main line, connecting London to key UK cities including Reading, Bath, Bristol and Cardiff. Production of these trains is already underway in the UK at Newton Aycliffe, County Durham. From Summer 2018 a second wave of new trains will begin running as far south as Penzance along coastal routes in Devon and Cornwall. The first of these trains arrived in the UK today. “Today marks another significant step towards delivering new trains, more seats, more frequent services and quicker journeys; and a step change in passenger experience on the Great Western. “Passengers travelling between London and the South West are today a step closer to experiencing modern trains. Our trains are designed to ensure passengers on long journeys have a comfortable experience with more luggage space and a smooth ride. “As the owner of this new fleet of Intercity Express trains, we are delighted to welcome the first Class 802 to the UK. This is a fantastic addition to our growing portfolio. We will continue to work closely with our partners GWR and Hitachi to support a smooth transition of the Class 802 into passenger service during 2018”.